One of the most common things seen on the features site is users asking for a feature request to be added to the next version of cPanel. While we do evaluate each request for inclusion in the version currently being developed, too many variable requests come through for us to include all of them. Today we wanted to talk a bit about what happens to the ones that aren’t picked up for inclusion in the current version being worked on. 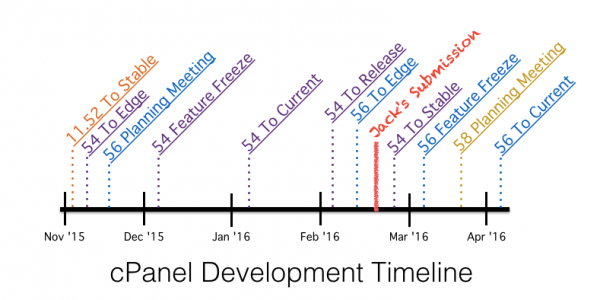 Jack submitted his request just two weeks before v56 arrives at what we call Feature Freeze. Feature Freeze for cPanel means that there will be no additional features added to that version of the product, and only bug fixes will be added from that point on. If our development teams can’t get Jack’s feature included in v56 before feature freeze, the earliest it will be included in the product is v58. Doing so will install the latest non-production, EDGE version of cPanel, and let you get a glimpse at the things coming in the next version. Currently it will install the latest edge version of v56 which includes (among other things), an upgrade to cPanel’s internal perl, a new one-page site builder, and a new tool to help you easily transfer server configurations. Version 56 has been in EDGE for a month, and it’s nearly ready for production. Now that Jack has a better understanding of the cPanel development cycle, and knows how to submit his feedback earlier, the next step is to reach out to us! Step one to getting your request implemented is to make sure you’re heard! Add your voice to the feedback that already exists on our feature request site, add a new request there, or email me directly to share what you think.